As one sat grieving in Pune last week on the loss of a sibling, one did not know that a few hours hence would bring a greater grief, a sense of greater loss, and a greater pain as the visuals began unfolding on TV of a handful of Islamist terrorists holding the mighty Indian Republic to ransom for nearly seventy two hours in Mumbai. In those seventy two hours while the Islamist terrorists who came by sea inflicted mayhem on a hapless Mumbai, all that was wrong in the political governance of India and the shameless abdication of India's security management by the Congress regime was brought into bold relief. India's ' National Honor' was once again allowed to be besmirched by the Congress regime by its politicization of counter-terrorism responses. India's 'National Honor' is something which is very dear to the heart of every right thinking Indian and today one can discern that there is not dismay but a groundswell of strong anger against the Congress regime for being insensitive to this sentiment on grounds of sheer political expediency , more particularly, prompted by the impending General Elections. This aspect was first touched upon by this Columnist last year entitled 'India's National Honor Besmirched by Congress Regime' (July 5, 2007). It was followed by a number of Columns stressing on strengthening India's responses to Islamist terrorism manifesting in multiple forms. I particularly refer to the following: 'India@60 : Political Reflections' (August 19, 2007); 'India Bleeds In Absence Of Anti-Terrorism Law' (May 17, 2008); 'Congress Government's Impotence in Fighting Islamist Terrorism' (September 14,2008); 'Congress Government Fiddles While India Bleeds' (October 5,2008) and 'India and Pakistan Do Not Share Common Terrorism Threats' (November 2,2008). 'Is it not a wake-up call for the Congress Government to develop Counter-terrorism strategies based on the bedrock of national security considerations rather than on the grounds of political expediency? No longer is the Indian public in a mood to accept fudged-up explanations for the repeal of POTA (Anti-Terrorism Law repealed by the Congress Government on assuming power in 2004)"
The Congress Government never took up the wake-up call but merrily continued in a state of denial that what were happening all over India were not isolated Islamist terrorist strikes but a well coordinated, well funded and well sponsored 'War on India'. It was not a war on India to divide India as Congress political leaders have oft-repeated but a war to besmirch India's honor and international standing by demonstrating that a handful of Islamist terrorists could hold the mighty Indian Republic to ransom. Cynically, one is also led to think that in the one month run-up to the Mumbai Islamist strikes had the Congress Government and its media camp followers allowed the intelligence agencies to focus more on the external terrorism threats than their new found fixation with 'Hindu terrorism' things could have been different. In the wake of the latest Mumbai terrorist strikes in end November 2008, the predominating mood there and in the rest of the Indian Republic is that 'Enough is Enough'. India's 'political secularists' are strangely silent presently. For the first time it is not only the common man in Mumbai saying so but even the upper strata of the society there including author and social celebrities there like Shobha De. Last evening she castigated the Government in a TV debate on allowing Mumbai to be repeatedly ravaged by terrorist strikes and raised a number of potent questions on the Congress Government's impotence in meeting the terrorism challenge. She castigated the political set-up at the State level and the national level for their tardy responses and paralysis in the first few hours of the terrorist strikes. Contrastingly, the Congress spokesperson was noticeable only in terms of outbursts when prickly remarks surfaced about the Congress President. Lest any of the readers come to the conclusion that this Columnist is a BJP man let me clearly state that I have no such linkages. If their brand of sentiments on Indian nationalism and India's 'National Honor' coincide with the views that I repeatedly stress in my Column it is a coincidence, the other way round. If I was a BJP man then with the views that repeatedly get reflected in my Columns then I should have been a BJP Rajya Sabha Member of Parliament by now. During the four days of the 'War on India' by Islamist terrorists in Mumbai, India's political leaders-civil bureaucrats nexus again failed India. The Congress Government of the day both at the Central level in New Delhi and in Mumbai stood paralyzed by the 'shock and awe' of the terrorists onslaughts. It is a measure of the Indian Prime Minister's bureaucratic background and fixations that yesterday at a review meeting of Mumbai crisis, as per TV reports, he summoned the Defence Minister and the Defence Secretary. It did not strike him that the Indian Army Chief along with his colleagues from the Navy and Air Force were the dignitaries to whom he should have turned to for professional advice and a professional review. It were they who handled the crisis. 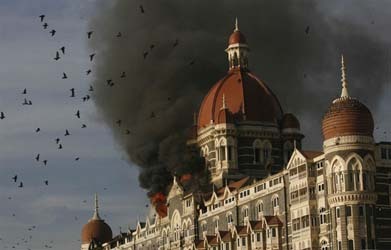 In marked contrast to the political leaders and their bureaucratic camp followers, during the four days of combating the Islamist terrorists 'War on India' in Mumbai, it were the 'Bravehearts' of the Indian Republic, the uniformed officers and men of the Indian Armed Forces and the Maharashtra Police who successfully met the war challenge by their bravery and sacrifice of lives. People are asking as to how many political leaders and civil bureaucrats sacrificed their lives?